A few days ago we celebrated my Cuban grandmother's 77th birthday. I'm half Cuban & Lebanese, so can already imagine what a nightmare it is for a GF plant based eater like me to try to sneak something to eat at family functions because there's barely ANY food I can actually have! Usually on occasions like this my family picks up traditional Cuban snack foods from the Cuban bakery or as we call them "cosas para picar," like pork 'croquettas' and 'bocaditos' filled with ham spread- again, a nightmare. Luckily Victoria Cookware sent me a cast iron skillet I had been meaning to use. And recently, I stumbled upon a recipe I saw on Pinterest I knew would be perfect for an occasion like this because, when the hell am I ever going to have an another excuse to make a massive mountain of vegan nachos again? Place the PARM ingredients in a food processor and pulse until you get little bits that look like parm. Set aside. In a small bowl mix all the black bean ingredients, taste for seasoning and set aside. In a pan with some olive oil, sauté the greens with the mushrooms and garlic until wilted. Season with pepper and salt and remove from the heat. 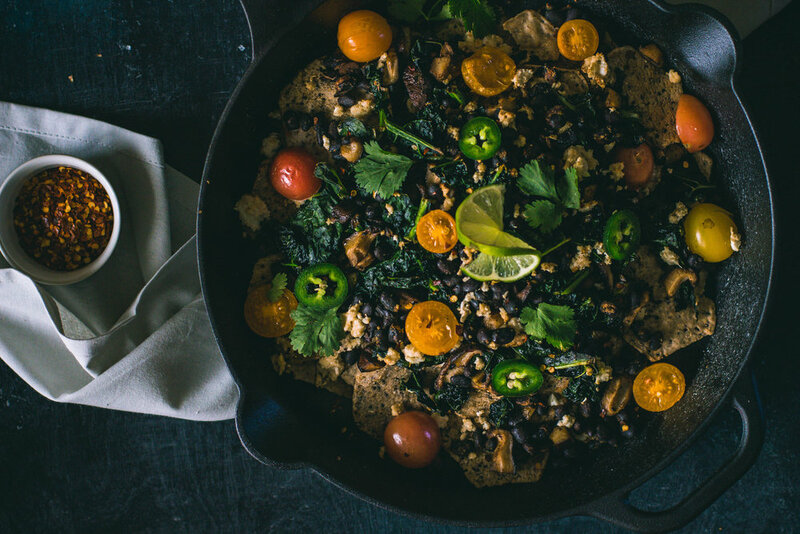 To build the nachos: place some of the cherry tomatoes at the bottom of your skillet, add each layer of the spiced beans, cauliflower parm, and tortillas, then repeat until you finish all the ingredients. Bake in the oven for 20-25 minutes at 350F until top is golden brown and tomatoes start to burst. Serve with cilantro and top with red chilli peppers if you like extra heat like I do! Shoutout to The Artful Desperado for the recipe inspiration. Had so much making my own spin on this!